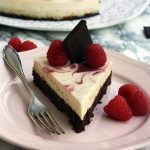 Fudgy brownie meets creamy cheesecake! 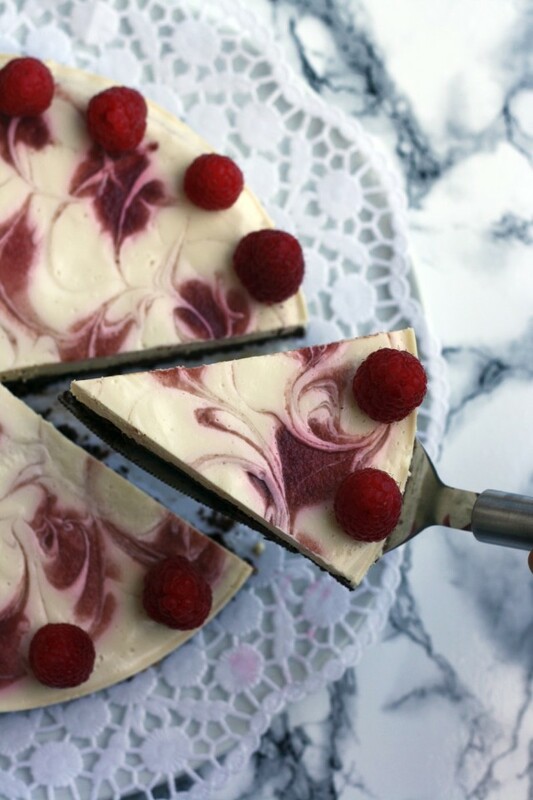 Delicious, healthy and gluten-free brownie cheesecake with raspberry swirl. Easy 50-min recipe from start to finish! 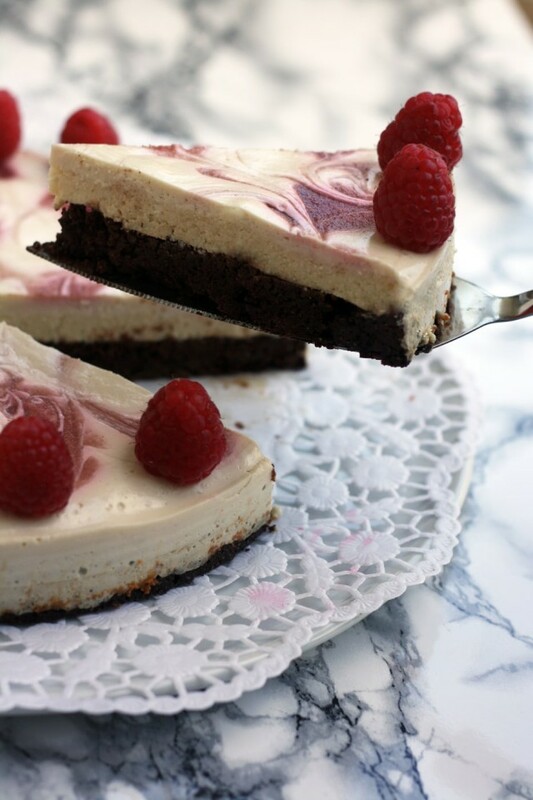 Have you ever craved cheesecake and brownies at the same time? My husband wished for this cake for his birthday. 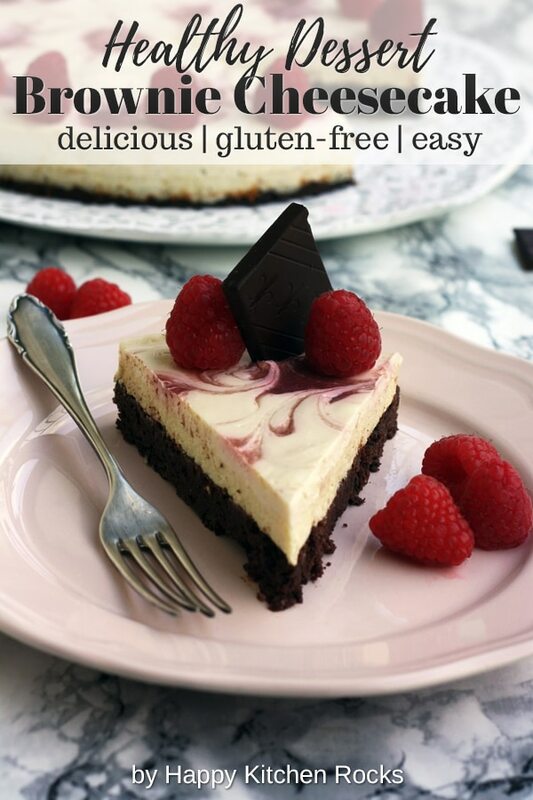 We are both huge fans of brownies and cheesecakes, so combining these two seemed to be an obvious solution! 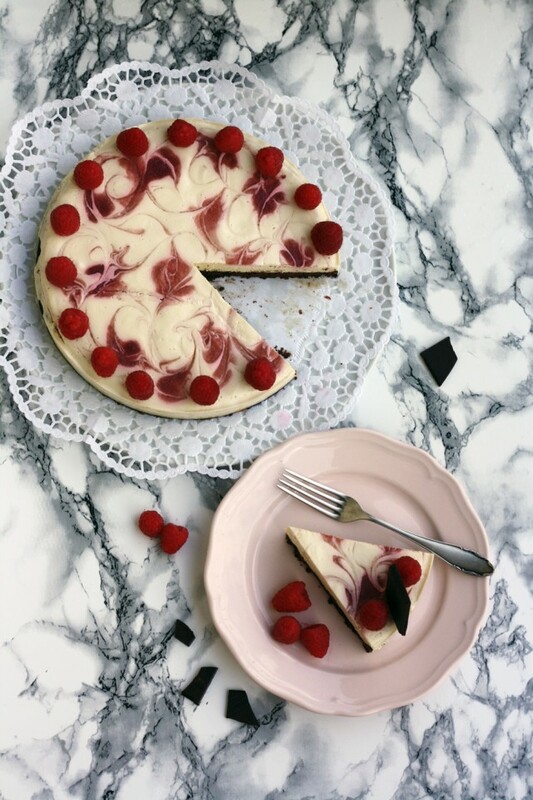 I tried my best to make this brownie cheesecake delicious and healthy at the same time and I think I managed to do it. Guests loved it, my husband loved and I loved it too! Mission accomplished. Here is the cake I made for him last year: Double chocolate tart with blackberries. For the next year I’m planning to make him this delicious bakewell tart, a traditional English pastry with almond frangipane filling and raspberries. 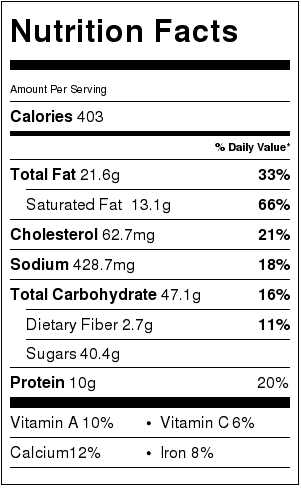 So, how did I make this brownie cheesecake healthy? 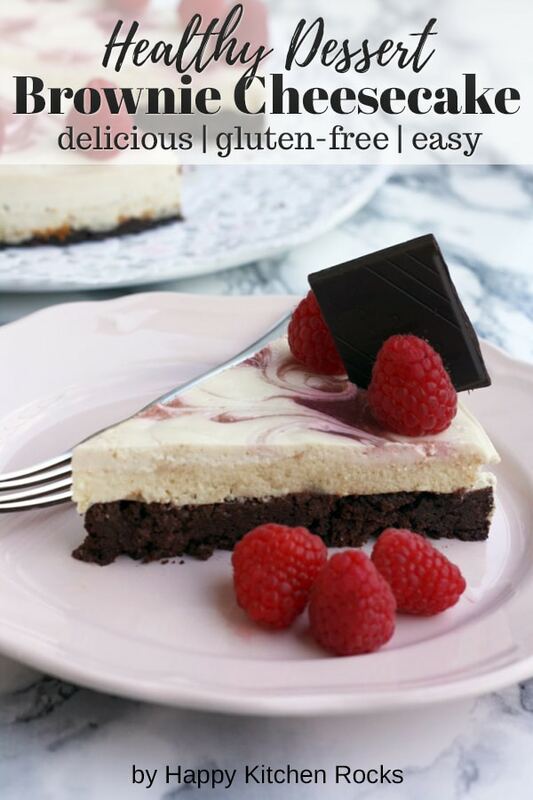 No white flour, no butter, no refined sugar, just cottage cheese for the cheesecake, coconut oil and gluten-free buckwheat flour for the brownie crust and delicious raspberry topping. For this recipe I recommend you to use rather dry cottage cheese or farmer’s cheese. To drain the moisture, wrap it in a clean cheese cloth and hang it above the sink until crumbly. 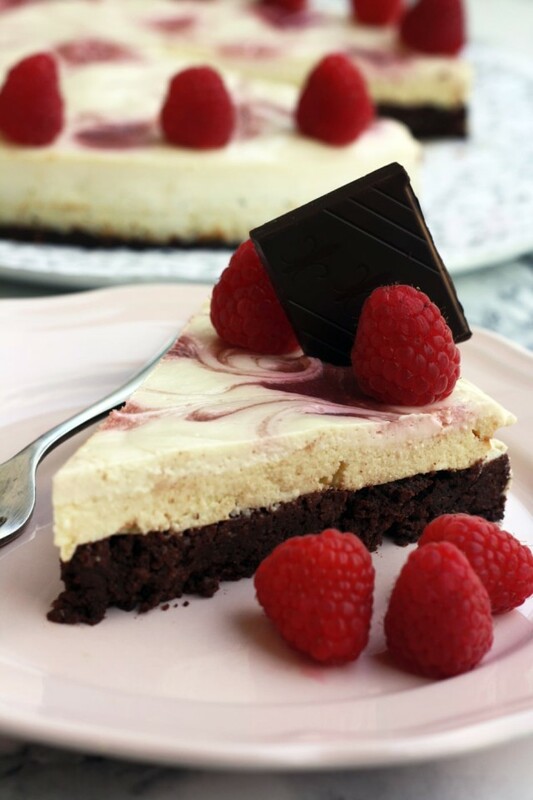 It would allow the cheese to set faster leaving brownie crust fudgy and moist. As for the buckwheat flour, you can substitute it for whole wheat flour or oat flour. I used buckwheat flour because it gives a nice nutty touch to the brownie crust. 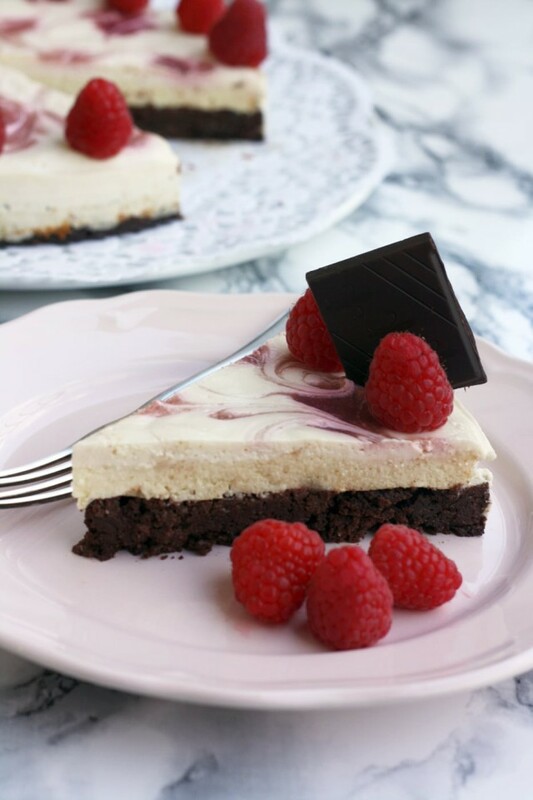 This brownie cheesecake won’t take you long to make. It’s also quite easy, even for non-experienced bakers. Start with the brownie crust. Combine melted dark chocolate (or chocolate chips), melted coconut oil, cottage cheese, buckwheat flour, brown sugar, baking soda and salt. Spread into a backing dish (I used a round 24 cm detachable cake form). For the cheesecake layer, blend drained cottage cheese (see notes above), eggs, brown sugar and vanilla extract. Spread the mixture over the brownie layer. Bake in the preheated oven for up to 40 minutes. Depending on the baking form you are using, you might want to check whether the top is set after 30 minutes of baking. The top should be set but still slightly wobbly in the center. The flatter is your form, the less time is needed for the cake to set. Meanwhile, prepare the raspberry swirl topping. Combine sour cream with brown sugar and set aside. Process raspberries with a hand mixer or blender until smooth. Pass through a sieve to discard the seeds (you can skip this if you want). Add maple syrup. 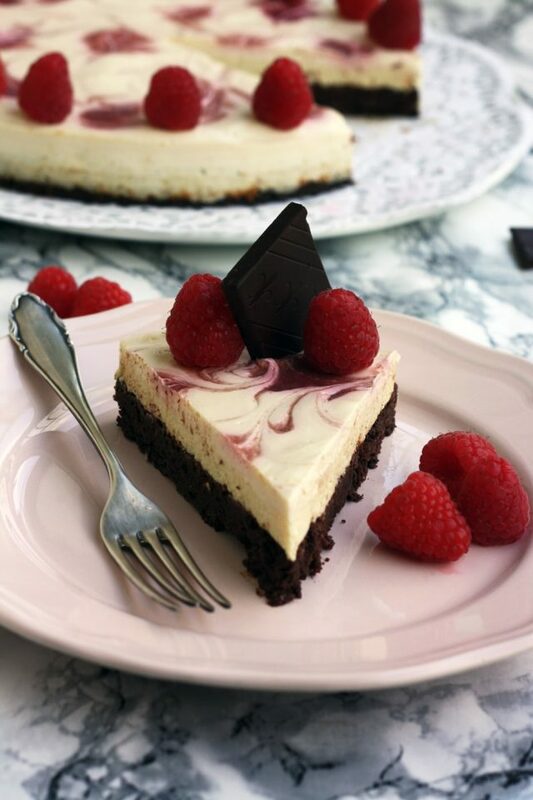 5 minutes before the cake is ready, pour the sour cream mixture over the cake and drop the raspberry sauce with a teaspoon all over the surface. Use a toothpick to swirl the sauce into the sour cream. Bake for 5 more minutes. Let the cake cool completely and put it in the fridge over night. 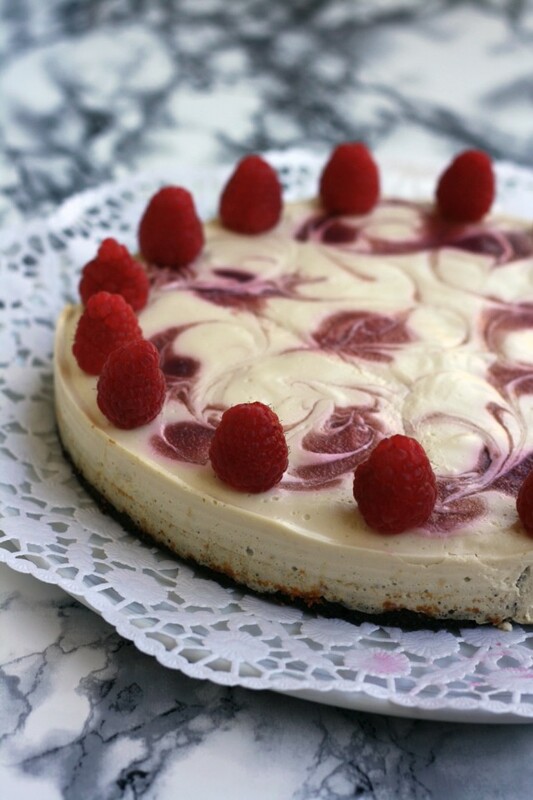 You can decorate it with fresh raspberries right before serving. Preheat the oven to 160 °C or 325 °F. Combine melted dark chocolate (or chocolate chips), melted coconut oil, cottage cheese, buckwheat flour, brown sugar, baking soda and salt. Spread into a backing dish (I used a round 24 cm detachable cake form). Blend drained cottage cheese (see notes above), eggs, brown sugar and vanilla extract. Spread the mixture over the brownie layer. Bake for up to 40 minutes. Depending on the baking form you are using, you might want to check whether the top is set after 30 minutes of baking. The top should be set but still slightly wobbly in the center. The flatter is your form, the less time is needed for the cake to set. Combine sour cream with brown sugar and set aside. Process raspberries with a hand mixer or blender until smooth. Pass through a sieve to discard the seeds (you can skip this if you want). Add maple syrup. Let the cake cool completely and put it in the fridge over night. 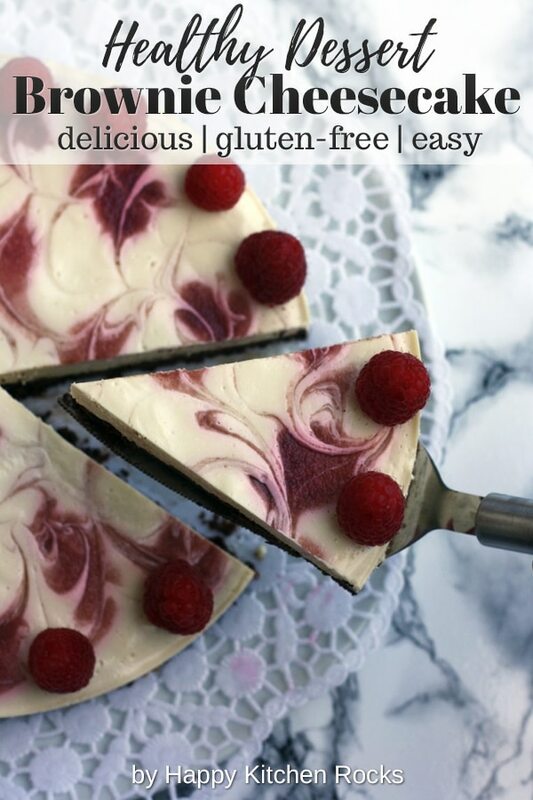 You can decorate it with fresh raspberries right before serving. Enjoy!